It might be the latest thing when it comes to IT and accounting systems but the fundamentals should remain the same. We advise and implement Cloud accounting solutions that work for your business and keep them grounded in practicalities of integration with your wider Payroll, ERP or CRM solutions. Regardless where you are in the world, with Xero you can run your accounts anytime from anywhere. Xero can be accessed from your PC, MAC, phone or tablet and Xero’s mobile apps can help you manage your business while you are out. 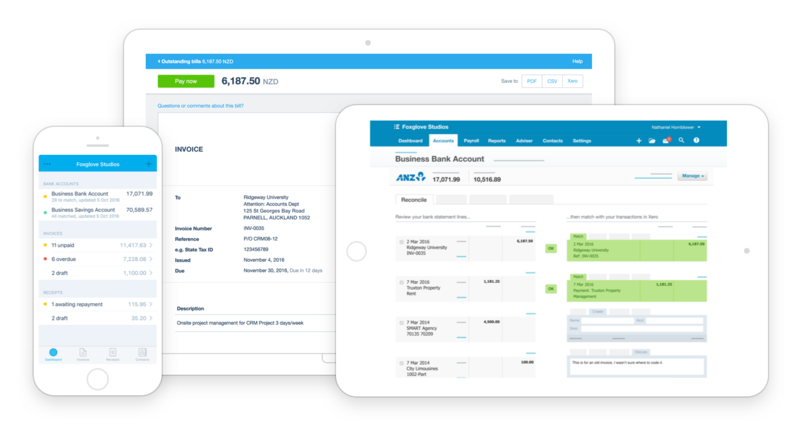 Xero allows you to email your invoices and know if your customers have opened them. With Xero’s bank feeds bank reconciliations have become a breeze. Setting up bank rules speed up data entry. Xero’s inventory management helps with stock control and provides you with the value of your stock at any time. Easy conversion from quotes to invoices once they have been accepted. Xero makes batch paying your suppliers easy. Supplier’s invoices can be emailed directly into your Xero organisation. No data entry necessary. Share your interactive budgets and reports with advisers and accountants in real-time. Store all your documents online in Xero and work towards a paperless office. MYOB offers a suite of accounting software solutions that vary in functionality. From MYOB Account Right Basic to MYOB Advanced there is no business in the SME market that MYOB cannot cater to. With more than 400 approved add-on options to choose from, there is nothing you cannot solve with an MYOB Account Right system. From sophisticated stock control, manufacturing, CRMs, complex reporting, membership manager or e-commerce. We have partnerships and expertise across a number of cloud software applications that can enhance and integrate with your core systems. Integration expertise in Cloud based Apps and CRM with Accredo systems to get the best out of all your systems. Unleashed makes inventory management easier and more efficient, integrating with Xero to take control of your stock and improve your businesses health. Whether you’re an electrician, plumber, builder, HVAC technician, locksmith, landscaper, or handyperson, Tradify can help your build a successful business..